I wanted to make a hat that I could wear with my Irish style fencing jacket. 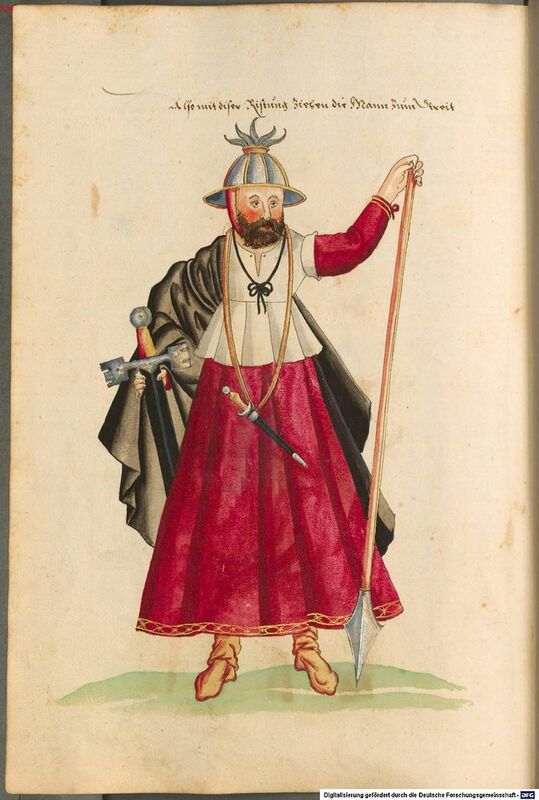 One of my favourite things about researching into 16th century Irish attire has been looking through images, and reading descriptions, of unique, odd, brightly coloured pieces of clothing and accessories. The hat I dub ‘the Onion Hat’ is one of these colourful, unique and odd things that I observed in my research. Over the years, I have come across three images containing four individuals sporting an Onion Hat; two females wearing versions made out of textiles (see Figures 1 and 2), and two males wearing a helmet in a similar hat to these women (see Figures 1 and 3). 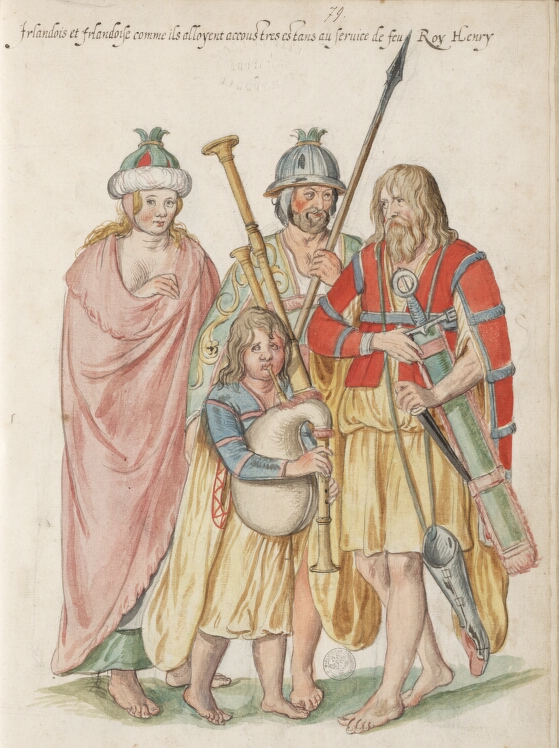 Figure 1: Irish people depicted in watercolours by Lucas de Heere (ca 1575). Each of these four examples of this shape of hat appear to be slightly different in materials and construction, but the overall styles are strikingly similar. I have not come across any other resources for this particular style of hat, nor have I seen any reproductions around the place. As such, I had to make up a pattern myself using skills I have, and use my knowledge of 16th century Ireland to infer what materials these hats might have been made from. I also felt that, as the general shape of this hat was observed on both men and women in this period, it would be a nice cross-over between the facts that I am a female wearing male fencing garb. Much of what is known about 16th century Ireland is through written accounts by the English. They all seem to refer to three different classes of Irish society: the poor where known as the ‘Wilde Irish’, the middle-class were known as the ‘Townspeople’ and the rich nobles were referred to as the ‘Civil Irish’. These different classes seem to be distinguished by their relative wealth, residence and by their dress. Of these three classes, it is evident from looking through various images and descriptions of Irish dress that the women in Figures 1 and 2 would be considered to belong to the ‘Wilde Irish’ class, according to the English. It would therefore be unlikely that these women would be particularly wealthy or noble. The wealthy in Ireland tended to adopt English fashions, including the fabrics that the English were wearing in his period. Silk, satin, velvet and damask were imported and used by those who could afford it. Linen nd wool was also used and many also trimmed or lined their luxurious clothing with a variety of furs, ncluding lambskin, wolf, fox, squirrel, marten, otter and rabbit. (Dunlevy, Pp 43-64, 1989; McClintock, Pp 30-118, 1950). Flax and sheep were plentiful in Ireland during this time and with this in mind it is no surprise to find that the townspeople and the poor tended to wear a lot of linen and wool (Morrison, c1600 from McClintock, 1950). Both black and white breeds of sheep were available, however, from the twelfth century onwards a higher value was attached to the white-wool sheep thanks to English influences (Duffy, Pp 8, 2005). Therefore, given that the two textile versions of these hats are depicted on ‘Wilde Irish’ women, I extrapolated that the hats were likely constructed using wool and/or linen. I decided to make a hat as similar in appearance to that on the woman in Figure 1 as was possible, because the colours and shape appealed to me most. A close-up of the detail on her Onion Hat is visible in Figure 4. Figure 4: Detail of the hats on Irish people depicted in watercolours by Lucas de Heere (ca 1575). I started by making a skullcap of four triangular pieces of linen sewn together to make the base of the hat (Figure 5). As a quick aside, more information about the history of skullcaps can be found online, as can images of 16th century skullcaps on Pinterest. The red linen was kindly donated by my friend, Baroness Ginevra Lucia di Namoraza (thank you!). 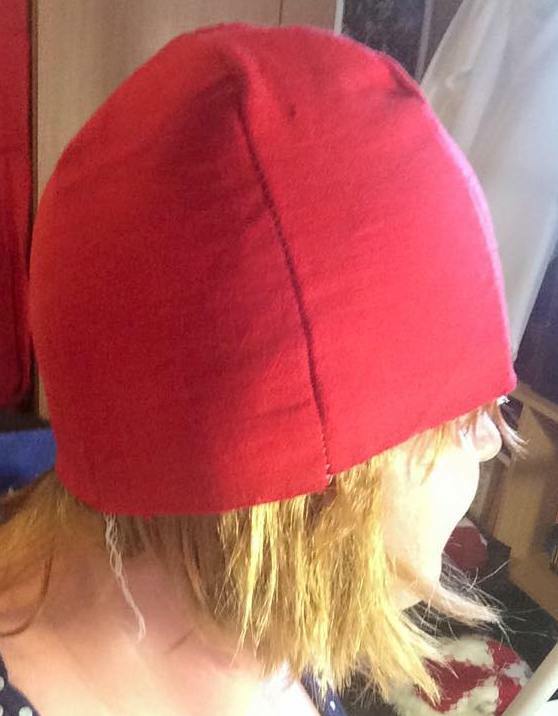 Figure 5: Four-panel skullcap in red linen by THL Ceara Shionnach, Jan-Feb 2015. Given that three panels are clearly evident in Figure 4, and that this likely represented about half of the hat, I decided to go with six green panels to make the ‘leafy’ bits on top of the skullcap. I chose wool for this because I figured it would be stiff enough for the ends to stand up on the top of the crown. The vibrant green wool I used was a kind gift from Mistress Heilwich Gheerts (thank you, too!). After cutting six panels out of wool, I whip-stitched the bases of the triangles to the base of the skullcap (Figure 6), and then used buttonhole stitch around the edges of the panels to keep them from fraying into the future. Figure 6: Six, green, traingular panels were cut out of wool and attached to the skullcap, by THL Ceara Shionnach, Jan-Feb 2015. The doughnut-shaped part of the hat in Figure 4 reminded me of the padded rolls used in Italian balzos. As such, I asked Mistress Francesca Cellini (thank you for the help!) about how she makes her balzo rolls and replecated that technique myself. Following these instructions, I made a ring out of wire that was a few centimetres bigger in diameter than that of the skullcap base. Then, I cut 5cm strips of padding and spiral-wrapped it around the wire ring. For the padding, I chose cotton batting from the local quilting supplies store, though it would have been more likely in period to have been stuffed with wool. 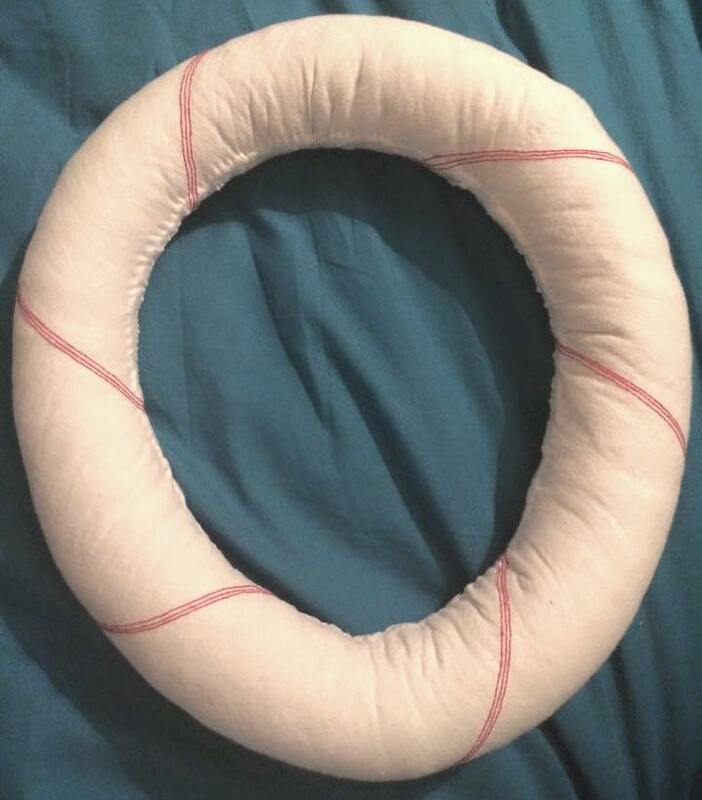 Next, I cut a strip of white linen on the bias that was slightly wider than the diameter of the thickness of the padded roll I had made around the wire, and slightly longer than the furthest distance around the entire doughnut shape. I pinned this bias-cut linen onto the padded roll, adjusting the tension as I went to get it as smooth as possible, and used it to entirely cover the doughnut. Finally, using stem stitch, I embroidered three parallel red spirals around the padded roll (Figure 7). I have not found any references to Irish embroidery in the 16th century, however, stem stitch is common throughout period and definitely in nearby English society in this time. I chose it for this reason, and because of the speed and ease in which I could apply it to the padded roll. Figure 7: The finished padded roll by THL Ceara Shionnach, Jan-Feb 2015. Next, I whip-stitched the padded roll to the base of the skullcap. Then, I needed a way to attach the six green panels at the top of the crown. Figure 4 depicts some kind of gold-coloured ring, seemingly used for this purpose. So, I found some gold hoop earings and pulled them apart, stitching the top sixth of the green panels to the ring in order to hold them up. 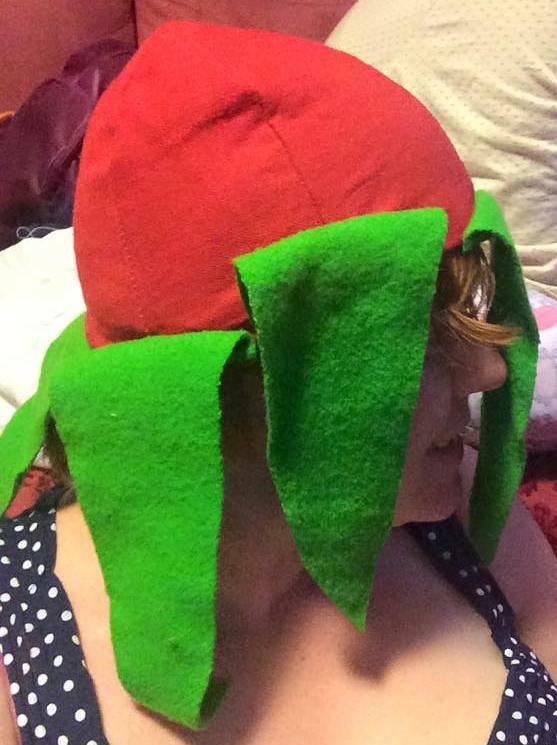 I finished the hat off by using my hair straightener to curl the ends of the green wool panels. The final result (Figures 8 and 9) is a relatively similar shape/colour to the hat observed in Figure 4. 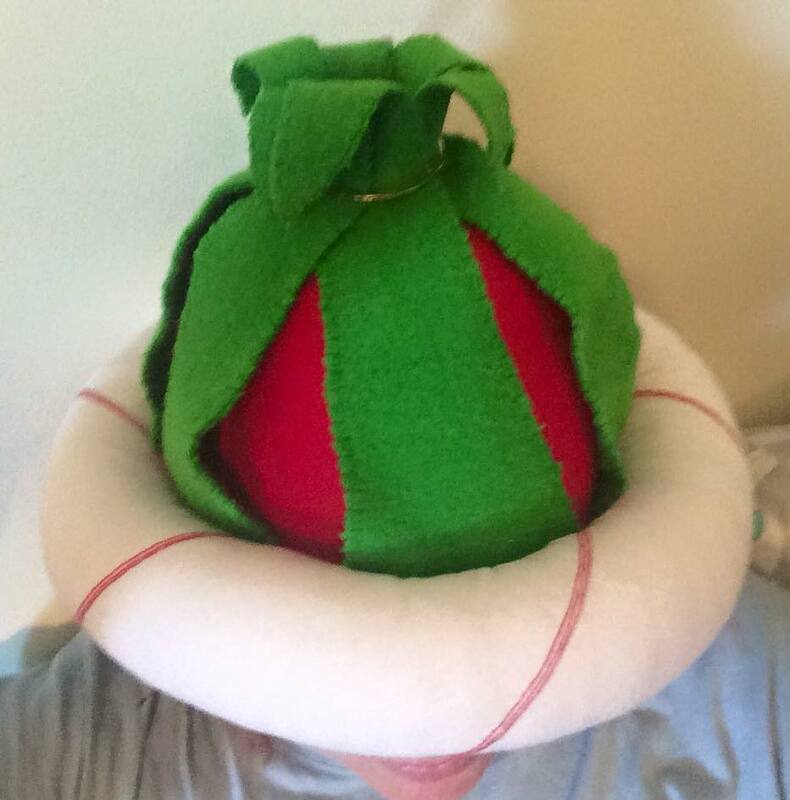 Figure 8: Side view of the completed Onion Hat, by THL Ceara Shionnach Jan-Feb 2015. 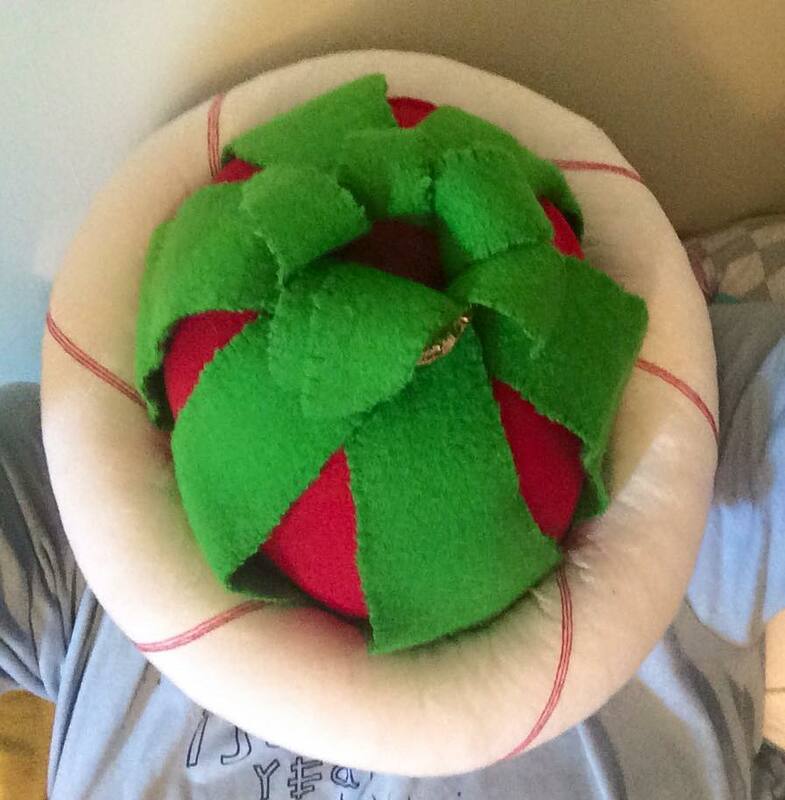 Figure 9: Top view of the completed Onion Hat, by THL Ceara Shionnach Jan-Feb 2015. Duffy, Sean (editor, 2005). Medieval Ireland, An Encyclopedia. Routledge, New York and London. Pp8, 114, 251-254. Dunlevy, Mairead (1989). Dress in Ireland: A History. The Collins Press. Pp 27-90. (Dunlevy, Pp 43-64, 1989; McClintock, Pp 30-118, 1950). Figure 1: Plate 81 – ‘Irish as they stand accoutered being at the service of the late King Henry’, by Lucas d’Heere, ca. 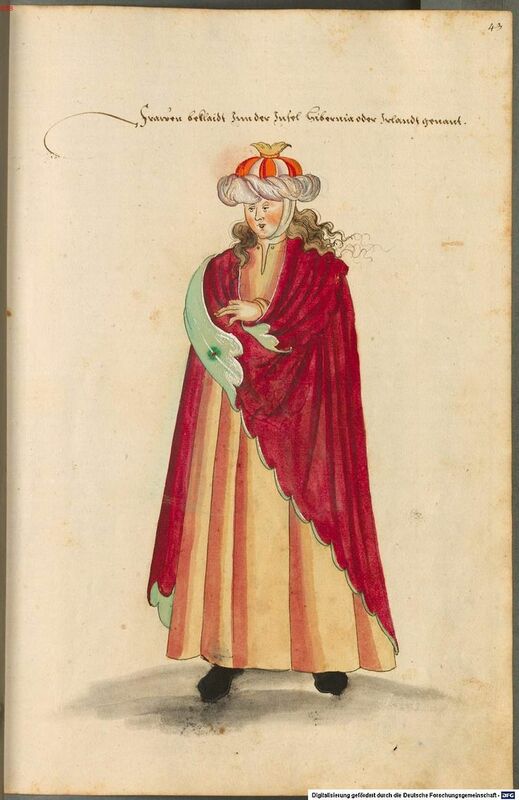 1575, as published in “Theater of all peoples and nations of the earth with their clothes and various ornaments, both ancient and modern”, as published online by the Ghent University, Belgium. Figure 2: Irish woman illustration, from “Kostüme der Männer und Frauen in Augsburg und Nürnberg, Deutschland, Europa, Orient und Afrika”, pg 43o, as published online by the Bavarian State Library, Germany. Figure 3: Irish man illustration, from “Kostüme der Männer und Frauen in Augsburg und Nürnberg, Deutschland, Europa, Orient und Afrika”, pg 43o, as published online by the Bavarian State Library, Germany. Pinterest album on ca-16th Century clothing (60+ images, men and women, covering a variety of examples and sources). You’ve got some wonderful A&S docs and articles. I really would love to get permission from you to add some of them to the Florilegium. (http://ww.florliegium.org ) . I will add links back to your blog so folks can find more of your work. You keep the copyright and I accept updates at any time.